Wow, 2012 certainly has been a time of change for the blog hasn't it? First I finally join Facebook. Then, I actually trust someone to be a writer on the site and now I've gone ahead and let myself be a guest on a podcast. See what happens when you don't sleep? You do all kinds of crazy things.... I'm teasing, I'm teasing. All these changes are good things I think, but I am looking for your feedback and constructive criticism. Please leave a comment and be honest about what you think, as long as you don't hurt my feelings, then I'll just be sad. Ok. A big thanks to Dennis of Dennis Has a Podcast for inviting me to be a guest on his show. You can grab the MP3 from his site or download the show from iTunes. Just think, you can listen to ice cream talk while going to work, walking, riding a bike, cooking dinner, anything. It's a whole new way to get involved with the wonderful world of frozen treats. 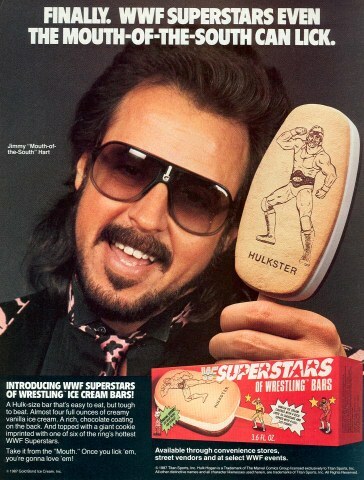 Now all I want is a WWF Ice Cream bar... 5 spoons up! Dennis, I feel the same way. I really miss those things and thanks for bringing back up that memory in the podcast. "I don't know if you have Friendly's up in New England" Seriously? If anyone follows the WWE wrestler CM Punk he was waging a war to get the Ice cream bars made again.